Yeah…I doubt 100/100 is a problem (for delay). Not sure what else it might be – maybe radio noise for the Z-Wave? Following up on the discussion about the VRCZ4s. I have two of them. One is brand new & still sealed in the original box. The other has been opened. It is pretty much ‘like new’ (as far as I can tell) except that the GREEN (ground) screw ‘came out.’ I’m not sure how to get it to ‘re-catch’ to get it to stay back in. Let me know your thoughts/interests. Sadly, neither had any effect on the state of the linked devices. Any steps I should take besides re-installing the driver and app software (done) and re “saving” the configuration information? Sorry, Kevin – didn’t see this before now. Yeah, after making sure you have my latest versions, you should try reconfiguring. Your outputs (above) are showing “button 0” and “null” throughout…while the latest code should be assigning (and recognizing) a unique scene number for each button. It looks like a very knowledgeable group on the Leviton Zone and Scene Controllers. Does anyone know if you can use either two VRCS4 for VRCZ4 controllers to connect to a single z-wave switch (Leviton switches in my case). I am building a house and planning on putting my load switches in a closet and using scene or zone controllers to control lights in the family room / kitchen / dining in an open floor plan. I would have two controllers connecting to a single switch. This post seems to indicate multiple scene controllers can be associated with a single switch but it doesn’t specifically call out either VRCS4 or VRCZ4. I would appreciate any help. Thanks! It’s worth noting that using the same configuration I’ve got 2 other leviton switches of the same make working in my house (WOW!) – It’s a real pain, but should pull the device and rejoin it? Is there any better reset button here? Hm…first, just to clarify: You’re saying (at the end) that two other VRCZ4s are working properly with the same DH/smartApp, but a third VRCZ4 is not? I’m not sure I have all the context I’ll need to fully make sense of those debug statements…but the first debug is certainly odd/curious. It’s happening when you turn one of the buttons on/off? I wonder: Since deleting/restoring the smartApp, have you also updated/reassigned the Device Handler to the latest version? And after updating both, have you then gone into the DH screen on your phone and pressed both “Configure” and “Get My State”? I have this working with my fabrio controllers to change my LED lights. Thanks a million! it’s only taken 3 years for me to have that controller sitting in the wall to work. So glad to hear that, James – thanks for the update! Hey Michael, I’m fairly new to ST (converting from Vera) so I may be asking a dumb Q. Thanks for posting your code. I was able to get my VRCZ4 working using a combination of the DH and SmartApp. I’m wondering if there’s any way to have one or more of the switches to control scenes instead of lights directly. Is that possible? I’ve not yet worked with scenes myself, and so I haven’t looked at this directly – but I imagine it should certainly be possible (if likely requiring some modifications to the code). Of course, VRCS4 is the “scene” version of the VRCZ4 (and has its own smartApp/DTH support – start here). Although I’ve never touched a VRCS4, one major difference is that the “scene controller” is effectively a 4-throw (mutually exclusive) switch – that is, only one of the buttons (scenes) is meant to be “on” at any given time, and turning “on” any one scene essentially turns “off” (or, really, overrides) the other three. The “zone controller”, on the other hand, is really four separate on/off buttons for separate (groups, or “zones” of) devices (although it should be possible to have the same device in more than one group or zone). That said, it’d be straightforward enough to alter the VRCZ4 code to make each button turn off the other ones. The other missing bit would be to set not only the on/off status, but also the level (dimming) for each device in the group/scene. This could all be built into the smartApp itself (including using the config to explicitly define the dimming levels for each device in each scene), but it might be better (and easier) to use something else to create the scenes (or even record/snapshot them, which is something I’ve been considering) and then just use the controller to activate/deactivate them. Probably best to start by soliciting input from the folks who’ve already dealt with and/or written about the VRCS4 (and some of whose code served as the starting point for my own), including @bdahlem, @ygelfand, @JDRoberts, and @aniceberg. I’m happy to assist with any modifications to my smartApp/DTH if/as needed, but would like to hear more from the “scene veterans” about how best to approach (including whether other smartApps/DTHs might already have this covered)? Great to hear – thanks so much for the update! And yes, it amazes me too (about Leviton). But it seems pretty clear now that they’prefer to promote lock-in to their own proprietary smart-home ecosystem. mkp, It looks like you’ve done a lot of good work in making the Leviton VCRZ4 controller usable with SmartThings. I’m just jumping in from another discussion where I mentioned that I have 6 VCRZ4s already installed in my house that are not being used because they aren’t compatible with SmartThings. In my case, I don’t need to have them work as scene controllers - having each button control a different set of devices would be fine for me. Could this be accomplished with the code you have developed to date. If so, how would I go about doing what is required? I cannot write or understand code, so it would have to be some straight forward, easy to follow, step by step instructions. Could you point me to anything like that? 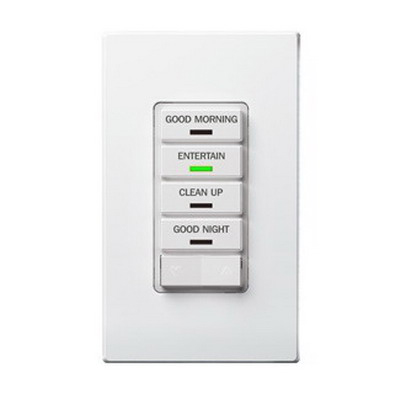 Yep – I just responded on the other thread: Wall-Mounted 120V Button Controller for Smartthings? Hello everyone. I’ve been away for 6 weeks and haven’t had a chance to follow up on mpk’s solution for connecting VRCZ$-MRZ to SmartThings. I’m back and would like to implement the solution. However, I am 71 years old and cannot write or understand code - so I would need some straight forward, easy to follow, step by step instructions for this. Are such instructions available anywhere? To recap, I have 6 VCRZ4s already installed and powered in my house. They are not being used because they aren’t compatible with SmartThings. Hi again, @rbcap – did you not find @JDRoberts FAQ link (above) helpful? You don’t have to write code, but you do have to use the SmartThings IDE (website) to copy/paste my code into your own SmartThings hub. Perhaps that sounds intimidating, but I’m confident we can talk you through it. Could you expand upon your tinkering? I have downloaded the vera firmware and extracted its contents but am having a bit of trouble finding where the LED z-wave commands are actually created. I see them referenced in D_SceneControllerLED1.json/xml but if you could point me in the right direction that’d be great. I have a VRCS4-M0Z I’m trying to use as a scene controller by writing my own device handler but I can’t get any LED response with the Hub actions you created so wanted to follow your path of reverse engineering Vera implementation to see if it sheds any light on proprietary commands I can use to control them.